So my sister got a new toy and I helped her unpack it and quickly stole it from her. Well, not stole exactly. She told me to take it. That way I could figure it out and then show her. Here it is, the new Fiskar’s AdvantEdge- the new interchangeable punch system. At first glance, it’s a bit imposing. The base is large without measuring (who measures?) I’d say 14″ x 6″ x 6″. However, it takes about 2 seconds to figure out. Great job on intuitive design! The punch cartridge snaps in place easily. 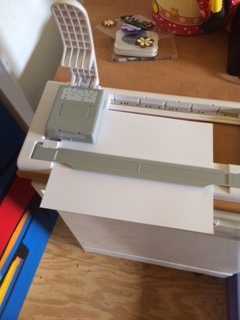 You lift the magnetic paper holder and slide in your paper. 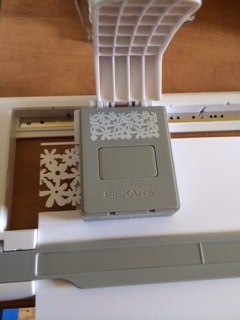 Flip the holder down to securely hold your paper and start punching. This is where the fun starts. Unlike other systems, you don’t move your paper. You move the punch. It slides on a tract and clicks into place at the next position. No more bifocals, No more wondering if you’ve moved your paper too far, or are overpunching. In fact, the physical feedback is so clear, you can even do this with your eyes shut. I know I did. The punches are super sturdy and nicely deep. 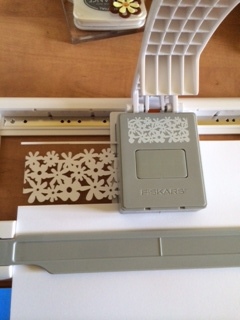 And if you have the Fiskar’s interchangeable border punches, they work here too. The AdvantEdge comes with an adapter specifically for these (less deep) punches. Super easy system. Paper is held in place. Designed to accommodate 12 x 12 paper. No need for fussy alignment. (I actually think the modern punches with the guides are pretty good, but I know lots of people that have a really hard time with them). Good handle for great leverage makes this arthritis friendly. Fairly pricey. 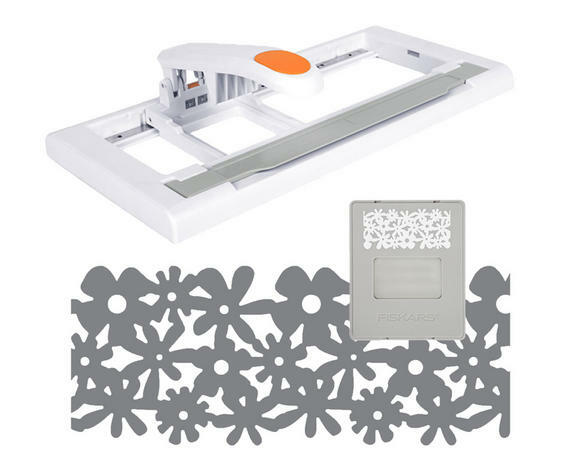 The base system is $49.99 but this comes with “flower garden” punch which like all the cartridges goes for $29.99. Compare a cartridge to a stand alone punches like the Martha Stewart Deep edge punches at $24.95. Not a ton more money, but you’d almost think you’d have a savings as part of a system. Heavy. The base is very light but the punches way a lot so may not be practical to haul with you on crops. Other: One thing I;d hope to get from an interchangeable system is space savings. Most of the punch makers have been trying to address this over the past many years. AdvantEdge with its large footprint and large dies takes the space of 8-10 of my other dies so it will take a bit of a collection to break even on the space. Overall: I like it. It’s quick and easy. High quality dies with nice deep designs. Great to use in classes. This entry was posted in Uncategorized on February 21, 2014 by twyladavis.